COACH TURNER THORNE: Well, I can speak for our whole team and coaching staff. We're ready to play. We've had a bit of a break here. It's been about almost two weeks since our last game, so we're excited to have an opponent. I think our region is just absolutely loaded. The WAC regular season and tournament champion New Mexico State women's basketball team learned its opponent on Selection Monday. The 15-seeded Aggies will stay close to home as they travel to Tempe, Ariz. to take on 2-seed Arizona State at the Wells Fargo Arena. The Sun Devils were regular season co-champions in the Pac-12 and lost to Cal 75-64 in the Pac-12 tournament's first round. The Sun Devils are 25-6 overall and 13-2 at home this season. They're led by 6-1 junior forward Sophie Brunner who is averaging 10.8 points and 7.5 rebounds per game this season. She is the only Sun Devil averaging double figures in scoring, however, ASU boasts four other players averaging at least 7.9 points per game. The game will follow the 7 vs. 10 matchup between Tennessee and UW Green Bay which is scheduled for a 3:30 P.M. start. Tip off time for the Aggies' game is scheduled for 5:30 P.M. MDT and the game will air on ESPN2. DENVER, CO - New Mexico State women's basketball head coach Mark Trakh was named the Western Athletic Conference Coach of the Year once again, as announced by the conference on Monday. Joining Trakh on all-conference awards list are Sasha Weber, Moriah Mack and Brooke Salas. DENVER, CO - NM State junior forward Brianna Freeman was named the Western Athletic Conference Player of the Week after posting back-to-back double-doubles over the weekend to help keep the Aggies undefeated on the year at 6-0. This is the first player of the week honor for Freeman this season and the third recognition in her career. The Killeen, Texas, product finished the weekend with 45 points, 26 rebounds, four blocks, four steals and a pair of assists in three games. 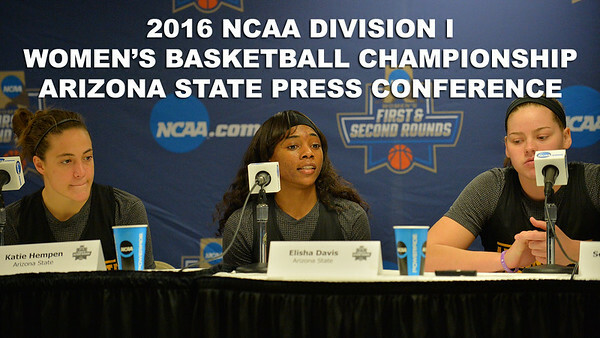 LAS CRUCES, N.M. - NM State head women’s basketball coach Mark Trakh bolstered his roster for the 2016-17 season with the additions of Ozahria Fisher, Najiyyah Pack and Aaliyah Prince on national signing day. Ozahria Fisher | Phoenix, Ariz.
LAS VEGAS, NV - The NM State women’s basketball team was voted as the favorite to win the Western Athletic Conference in the 2015-16 WAC Preseason Women’s Basketball Coaches and Media Poll, the conference announced on Wednesday. Junior forward Brianna Freeman also swept the honors as the WAC Preseason Player of the Year in both polls. The reigning WAC Player of the Year averaged 14.9 points and 5.2 rebounds to go with her 64 assists, 53 steals, 27 blocks and 41.9 shooting percentage last season. In the head coaches poll, NM State tallied 7-of-8 possible first-place votes for a total of 49 points with CSU Bakersfield coming in second with 39 points. Seattle U garnered 33 points and was the only other team to receive a first-place vote. UT Rio Grande Valley tallied 30 points while Grand Canyon (27), Utah Valley (26), Missouri-Kansas City (13) and Chicago State (7) rounded out the rest of the league. In the media poll, the Aggies tallied 9-of-10 first-place votes for a total of 79 points. The media poll was quite similar to that of the coaches poll except UTRGV was predicted to finish third instead Seattle U while CSU Bakersfield received the only other first-place vote. Joining Freeman on the preseason first-team list are seniors Sasha Weber and Shanice Davis in the coaches poll. NM State led the pack with three players selected while CSU Bakersfield and Seattle U tied for second with two each. LAS CRUCES, N.M. – The defending Western Athletic Conference Champion New Mexico State Aggies announced the 2015-16 Women's Basketball Schedule, featuring 17 home contests on the 32-game schedule. Coach Mark Trakh's Aggies return all five starters and 12 letterwinners from last year's 22-8 team that won their first WAC Championship with a 13-1 league mark, won the first WAC Tournament title and advanced to the NCAA Tournament for the first time since 1988. The 2015-16 slate features five postseason participants from last year in non-conference play (Northwestern State, Sacramento State, Long Beach State, Fordham and New Mexico) along with traditional powers Vanderbilt and Arizona. LAS CRUCES, N.M. - The Women’s Basketball Coaches Association (WBCA) announced on Wednesday that New Mexico State women’s basketball head coach Mark Trakh is one of eight recipients of the 2015 United States Marine Corps/WBCA NCAA Division I Regional Coach of the Year award, and is now a finalist for the Pat Summitt Trophy to be presented to the 2015 United States Marine Corps/WBCA NCAA Division I National Coach of the Year.